Last month, Pacific Ridge language teachers Mrs. Brady, Mrs. Shrivistava, Mrs. Chu, and Mr. Stella presented at the American Council on the Teaching of Foreign Languages (ACTFL) Convention and World Languages Expo in downtown San Diego. 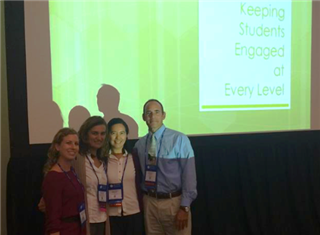 The group taught a session entitled "Keeping Students Engaged: Instructional Strategies for Elementary, Middle School, and High School Levels." They discussed teaching approaches that are engaging and student-centered, and encourage students to use their language skills in authentic, meaningful contexts. The annual ACTFL conference attracts more than 6,000 language educators from around the U.S. and the world.